About a month ago I did a talk at our local garden club, Jamberoo Community Growers, about using swales for water harvesting. Below are the notes from my talk – please let me know if you find them useful! A perfectly level ditch, following the contour of the land. What does a swale do? Water harvesting: captures surface water flowing downhill during rain. Slows the movement of surface water across the landscape, putting it to use rather than just letting it flow off. Spreads the water evenly along the length of the swale. Water will naturally flow into gullies and away from ridges – swales redistribute it more evenly. Holds water for some time (usually days, up to a week) after a rain event, allowing it to slowly infiltrate into the ground. Hydrates the slope below the swale, storing water in the soils and sediments underground. You won’t need to water even the most fussy plants on a swale for a few weeks after a rain event – more hardy plants won’t ever need watering. 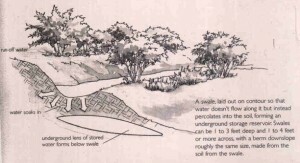 How do you build a swale? Start by marking out where it will go – dumpy level/a-frame, clear hose, builder’s level on plank, laser level. Use little flags or pegs to mark the uphill edge of the swale. Dig a trench along the marked line, piling the removed soil on the downhill side of the trench to make a mound. Think about what will happen if the swale overflows – plan a spillway that won’t erode during high flow, and ensure that the water that exits won’t cause problems downhill. Make the bottom of the trench level. Crack/chip the bottom of the swale to aid water infiltration. You can completely fill the swale with mulch (leaves, sticks, wood, bark, etc) (good for smaller swales) or leave a trench/gullly that will fill with water. Mulch the swale mound well to prevent weeds and erosion. Plant legumes on the mound (pigeon pea, cow pea, clover, tagasaste, wattle, etc) to build soil nitrogen and act as nursery trees for your crop species. These can be “chopped and dropped” as mulch during the life of the swale. Plant fruit and nut trees on the top of the mound (for plants that like drainage) and below the mound (for plants that like moisture). Build successive swales down a slope, giving consideration to how they overflow into one another. Space neighbouring swales widely on shallow slopes, closer together on steeper slopes. Important: Plant out and mulch the swale immediately after construction so you don’t have to fight with weeds later! If you don’t get the levels right, you can get a heavy flow of water along your swale and concentrate it to the overflow point, which might cause problems downhill. Even worse, it might burst through the mound somewhere along the swale and erode it out. If you don’t plant trees below the swale, you’ll cause waterlogging by infiltrating more water than grasses and small plants can absorb. High evaporation can cause salt buildup. You need to ensure the base of the swale is not sealed like a dam, but allows slow infiltration of water. 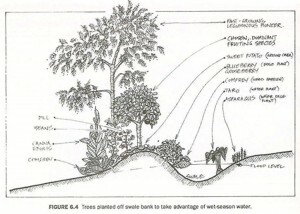 Trees help take up the water and shade the trench to reduce evaporation. Water lost to evaporation is water not used! Get the overflow point right! Make sure it won’t erode during high rainfall (e.g. line a sill with rocks or pavers, or use buried overflow pipe through the mound). Plan where you’re directing the overflow water, and ensure a heavy storm won’t cause downhill problems. Don’t allow plants to grow thickly and clog up your overflow points. 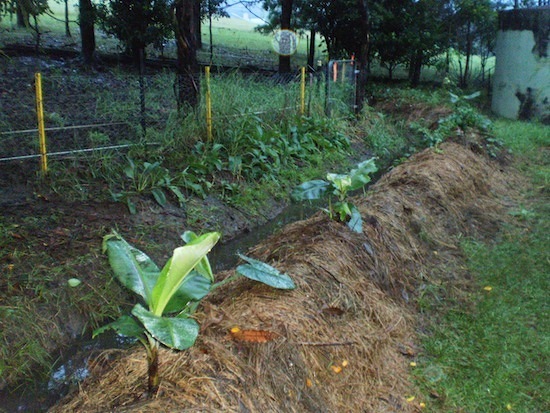 My backyard swale, planted with taro, bananas, mango, and sweet potato. Make swales a generous width, fill them with wood chips or green waste mulch to level the surface, and use them as access paths. Water will be held in the mulch, reducing evaporation and encouraging beneficial fungi (mycorrhiza), but the top layer will be dry for walking on. Similar to above, dig ditches on contour in your vegetable garden beds and fill them with mulch as access paths. Create crescent-shaped mini-swales for individual trees. They’ll collect water (possibly from a wide area) and concentrate it for infiltration just uphill of the tree. Direct swale overflows into water features, dams, rain gardens, banana circles, or (if you don’t have any other options) stormwater drains. Direct greywater (from laundry, outdoor showers, etc) into a slotted irrigation pipe that runs along the bottom of a swale. Cover the pipe with lots of wood chips and mulch, so the greywater won’t sit at the surface. Road or driveway runoff and rainwater tank overflows can also be directed into swales. On rocky ground that can’t be dug (or if you don’t have the time and energy! ), place fallen trees, branches, sticks and rocks along contours (across the slope) and fill behind them with mulch, compost, dirt, rocks, etc. When it rains, more silt will wash down the slope and build up behind the branches, creating a swale-like mound. Plant water-loving plants (taro, rice, kangkong, lillies) in the swales, and moisture-loving plants (asaparagus, mints, blueberries, bananas, ginger) just above the swale flood level. In large swale systems, small dams or pools can be created by deepening and widening the trench at intervals. This would create a string of ponds that link up during rain events, much like billabongs along a river. Swales are starting to be used in urban planning to reduce water flows, nurture street trees, and reduce the amount of water going into stormwater systems. Aim to keep all the water that falls on your land, on your land! Geoff Lawton, in a podcast interview with Paul Wheaton, said that it takes 7 years for a swale system to stabilise and fully rehydrate the landscape below it. great post Darren, I was very impressed with your swale when I seen it, it’s fantastic that you came up with plan to keep the water out of your shed. It was suggested to me the other day of building a swale on the high side of my newly planned garden bed in the front yard, but I’m pretty sure I don’t want it there. His heart was in the right place though. Very informative reading, thanks! @Nellymary: Thanks! I had a builder mate over on the weekend, and he was surprised that I had dug that swale by hand. It really didn’t take that long, though – you don’t have to hire an excavator for every ditch you dig! Thanks heaps for the post 🙂 Very useful! I find that Aussies are generally quite surprised when a shovel is used to dig any more than a small hole. It really does not take that much effort and for the bigger ones, it should save the cost of a gym membership. I would not recommend the mango on the swale. Mangos are pretty tough and do not need that sort of location. I would recommend the mango somewhere that the soil is not as good and there is not as much moisture. While they are gross feeder when young, once established, they do not need much to get great fruit production. A small leaf Jaboticaba would be an excellent replacement for the mango. It loves moisture, but is also a tough plant. @Jason: I’ve got a small jaboticaba in another part of the garden – perhaps I should swap the two trees around. Figuring out where to put trees is one of the hardest parts of property design! I think I tend to go about it the wrong way around: I buy trees I like, and then try to figure out where to put them. I should be looking at the yard and figuring out what type of tree would go well in a particular spot, and THEN buying the trees for specific spots. I agree with you on the digging – it does’t really take that much time, and you can split it over a few weekends. When I was widening/deepening this one, I just did about 5-10 minutes of digging each morning after feeding the animals. It only took 2 or 3 weeks to finish off, with no sore back or blisters to show for it. Hi Darren, thanks for the explanation, I have read about swales, but nothing this practical! We have a sloping block, so I’m now thinking where to put a swale…..
@farmer_liz: No worries! I was a bit concerned that it was a bit of a thought-dump, just talking points roughly organised, but I didn’t have time to write it up properly so I posted it anyway. I think it actually works, though – the facts don’t get lost in long-winded discussion and embellishment :-). The above represents the info I gleaned from more than a dozen hours of reading books, web sites, watching videos, etc. Really informative blog. Much thanks again. Fantastic! 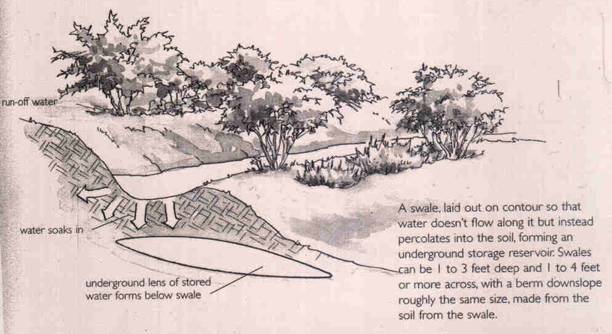 Wow, I love the idea of a swale, like most of the permaculture it makes so much sense. We’re on a nice sloping hill and this would fit perfectly into the design as an addition to the veggie garden and orchard and keep the water where we need it most. Thanks for posting! @Marijke: I hope it’s useful for you! It sounds like you have the right situation for a swale. I have just been helping produce some instructional videos for Alice Water Smart in Alice Springs and we have shot one about water saving garden design. We shot this at the local community garden, and would love to include one of your illustrations of a swale to help explain what a swale is. Please email me back if you are happy for this to be included in the video to help educate people about swales and water smart garden design. We could probably put a link to your site on the website which is under development. Thanks! This is a really educational post, Darren. You have a knack for explaining ideas in common language, in an easy to follow manner. You picture is a great example of a swale too. @Pavel: Thanks! Glad you found it useful. Your blog is well worth reading as well, especially for Australian permaculturists.